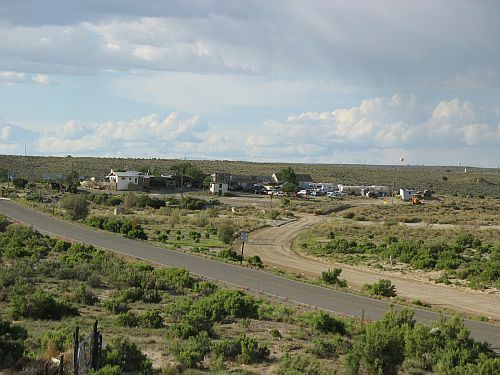 In 1918 my great-grandparents built a trading post in the San Juan Basin of northwestern New Mexico, between Chaco Canyon and the town of Farmington, which was then and is now the main town in the area. They had both grown up in Farmington and married in 1908, after which they spent a few years emulating the farming and small-scale ranching lifestyle of their parents and most other local residents, but they were unsatisfied with this and began to look for other opportunities. Some other members of their families were beginning to go out into the vast rural areas nearby occupied by the Navajos to establish trading posts, and they were curious enough about this to move out to one of these stores to help out for a while. They found that they liked it and began looking around for a store of their own to buy. The story goes that my great-grandfather was heading out to look at a store that was being offered for sale and on his way over happened upon two brothers who were building a store at a very promising location at the confluence of a small side wash with the Gallegos Wash, one of the main drainages in the region. The Navajo name for the area is Hanáádlį́, which means something like “the place where it flows out again,” which presumably refers to something about the confluence of the two washes. He offered to buy the store from them, but they were not interested in selling, so he continued on to the store he was headed towards. He found it much less impressive and decided not to buy it, but on his way back he encountered the brothers again at their much better location. By then they had had a falling out, and according to local lore were even running around shooting at each other, and they were quite happy to sell. So my great-grandfather bought the store, moved his wife and two daughters to the site, and finished building it. Their last name was Carson, so the store came to be known as Carson Trading Post and the community surrounding it is often called Carson. 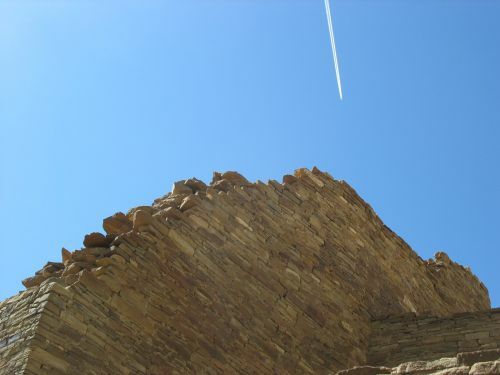 It is very close to Huerfano Mountain, one of the most sacred mountains to the Navajos and the site of many events recounted in the Navajo origin story. The Carsons ended up having four daughters, all of whom grew up, married, and went on to own trading posts of their own. 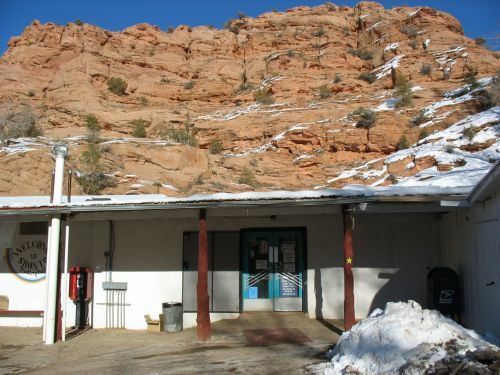 These stores were scattered across the Navajo Reservation and the surrounding off-reservation areas inhabited primarily by Navajos in New Mexico, Arizona, and Utah. One daughter, my grandmother, stayed at Carson’s, and there she and her husband raised their only child, my father, who was born in 1947. When my he was old enough for school they bought a house in Farmington and he and my grandmother stayed there during the week and went back out to the store on weekends. Meanwhile my great-grandparents, having turned Carson’s over to my grandparents and attempted to retire to Farmington, found that retirement was not for them and ended up buying another trading post, this one way out in the western part of the reservation in Arizona at a place called Inscription House, named after a local Anasazi cliff dwelling that is part of Navajo National Monument but that has now been closed to the public for many years. A little later, my grandfather and his brother-in-law, who owned Two Grey Hills Trading Post and a few other stores in that area, teamed up to buy another store near Inscription House at a place called Shonto. They were both busy with running their other stores, of course, so Shonto was run by managers for the rest of their lives. One of those managers was my father, whom his parents sent out to Shonto around 1972 after he had graduated from college and moved back to Carson’s, where he apparently just sort of hung out for a couple of years. When they sent him out to manage Shonto they let him hire an assistant manager, and he hired a friend of his from college named Les. Les’s girlfriend at the time came out to join him. I don’t know many of the details about what happened over the next few years, but the eventual result was that Les and his girlfriend broke up, he married one of the Navajo clerks who had worked in the store, and she married my father and in time became my mother. I was born in 1984 and my sister was born in 1986. My grandmother and grandfather died in 1985 and 1987 respectively, and two of my grandmother’s three sisters died around that same period. 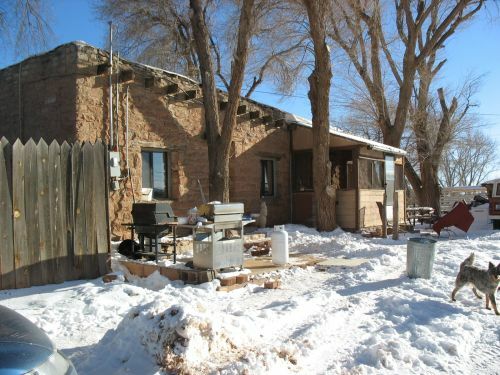 At the same time the trading business was falling on hard times as social and technological changes were making the Navajos less isolated and more integrated into the mainstream American economy, which eliminated the economic and sociocultural niche the trading posts and traders occupied as cultural intermediaries. By 1991, my parents had come to believe that there was no real future in the trading business, and they decided to just sell the store, move to Albuquerque, and try to make a new life. My dad applied to a PhD program in history at the University of New Mexico, and my mom, who had gotten a teaching certification from Northern Arizona University, got a job as a kindergarten teacher in a small, semi-rural school district south of Albuquerque. This kind of wholesale lifestyle change was one way trading families during this period dealt with the changes that were wreaking havoc with their way of life. 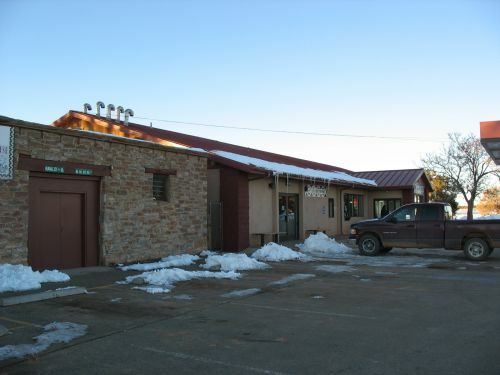 Another option was to try to upgrade and modernize the store to try to actually compete with the businesses in the reservation border towns that were becoming the traders’ competition. This was a very risky approach, because it was not at all certain that even massive investments could make a store competitive, but some traders felt they had no other real options. One of them was a second cousin of my dad’s named Al, who had ended up owning Inscription House at this point. He didn’t have the sort of educational background my parents had that enabled them to go into other careers in town, so he decided to build a laundromat and big modern grocery store as adjuncts to the old one-room trading post, which he turned into a hardware store. What Al did at Inscription House was mostly just separate the goods carried by a typical trading post into separate buildings. Trading posts functioned much like old-fashioned general stores, and they carried any and all goods that the community might need, including foodstuffs, dry goods, hardware, and weapons for hunting or for shooting coyotes or stray dogs that got into people’s sheep. In the early days the stores functioned economically on the basis of a credit system whereby the local Navajos would run up bills of credit for the goods they purchased and pay them off with wool when they sheared their sheep or lambs when they had them. The trader would then sell the wool and lambs and use the money to buy more goods. People would also often sell arts and crafts to the stores, and this provided a supplemental income stream for most traders. A few stores in certain areas where arts and crafts were particularly well developed, in some cases as a result of influence by early traders, bought and sold large amounts of arts and crafts, but for most of my family’s stores this was a minor sideline and the core business was in wool and lambs until the penetration of cash into the Navajo economy reached a point where most stores stopped extending credit to most customers and became effectively cash-only operations. In most areas this took place sometime in the 1970s or early 1980s. Some observers consider this the point at which the traditional trading post ceased to exist, but I think that’s an overly narrow way to define the institution. 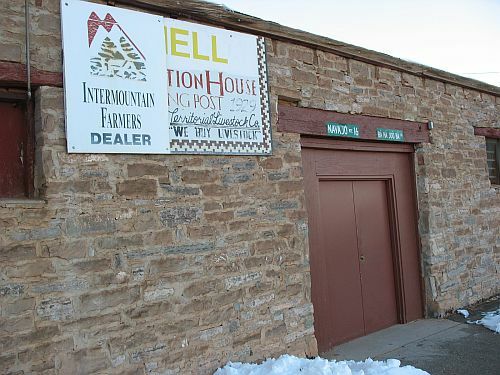 From the Navajo community’s perspective, certainly, the trading posts still existed after they stopped extending credit, because they still provided the same variety of goods. 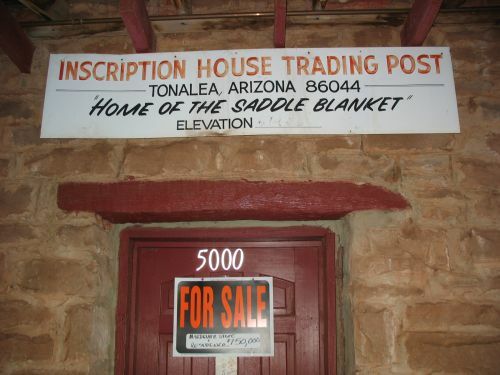 The term “trading post” I think leads a lot of Anglo observers to think of them primarily in terms of the system of exchange that supported them admittedly for most of their existence, but in Navajo the word for “trading post” is naalyéhé bá hooghan, which literally means “house for merchandise.” The word for “trader” is naalyéhé yá sidáhí, literally “the one who sits for the sake of the merchandise.” This certainly implies, to my mind, that the key element of a trading post from a Navajo perspective was the goods it provided to the community rather than what it took in exchange. Be that as it may, by the late 1980s there were few trading posts left by any definition. 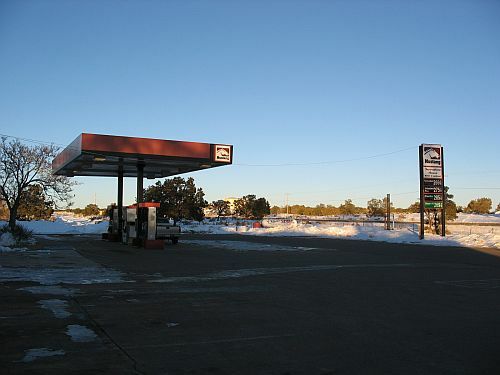 Many had closed entirely, and some, especially those that happened to be located on major highways, had converted to simply gas stations and convenience stores, no longer offering the wide range of goods that they had before. People could now go into town on paved roads to buy those goods at Safeway or Walmart for much less than the traders charged, and there was no way most old stores could compete. The handful of stores that specialized in high-quality arts and crafts had an option not available to most stores to focus more on that as their business, and some did just that, opening shops in Farmington, Gallup, or even Santa Fe to sell the rugs and jewelry they would buy from their customers. Two Grey Hills, which by this point was run by my parents’ old friend Les, was able to eke out a living without changing much about its business model just because the rugs it got, widely acknowledged to be the finest Navajo rugs anywhere, brought in enough money on the infrequent occasions when someone stopped by to buy one to keep the business afloat. Al’s gamble at Inscription House paid off because the area was sufficiently isolated that competition from the nearest town, in this case Page, Arizona, was not as intense as in the case of many other stores, and because most of the other stores in the area were no longer vibrant enough to be much competition, if they were open at all. 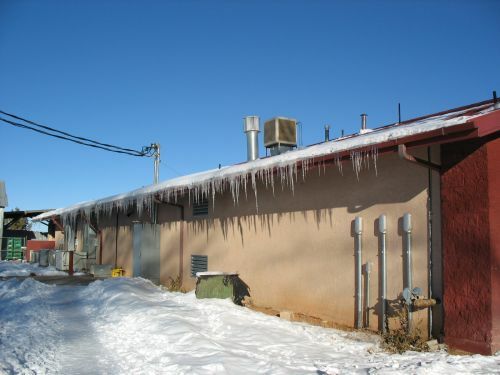 After we sold Shonto the new owner struggled to find decent managers and eventually lost the lease, which resulted in the property reverting to the ownership of the Navajo Nation, which closed it for a while. It’s now open again under a new manager working for the tribe, but it’s a shadow of its former self. 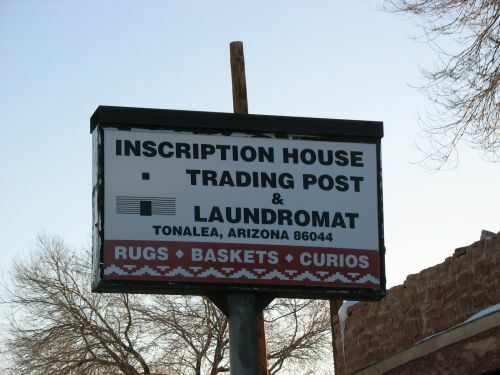 It’s not much competition for Inscription House, which is still going relatively strong, although the last time we visited there Al had closed the hardware store and focused all operations on the new store. While all this was going on, however, during the 1990s, we were in Albuquerque, and my childhood there was pretty typical of the suburban Sunbelt. We would continue to go out to the reservation frequently to visit family and deal with various hassles in the process of selling Shonto, which took several years, so I remained aware of what it was like out there. I knew that I hadn’t really experienced the trading lifestyle for myself, however, since I had been six years old when we’d moved and only had vague memories of actually living at the store. During two summers when I was in high school, therefore, I decided to spend some time out at the remaining trading posts operated by family and friends of the family: Inscription House and Two Grey Hills. The first summer I spent two weeks at Two Grey Hills, then two weeks at Inscription House. I don’t remember why the periods were so short; I guess maybe I was trying to ease myself into what was a somewhat unfamiliar experience. There was very little for me to do at Two Grey Hills, which didn’t get much business, so I spent most of my time taking care of the extensive gardens and cleaning the place up for an annual festival the store had begun putting on in 1997 for its hundredth anniversary and had continued in subsequent years. I think Les was mostly taking me on as a favor to my parents. Al, on the other hand, was very enthusiastic about having me come out there, I think in part because he had been somewhat isolated from the family for various reasons for several years and wanted to cultivate closer ties. There was plenty of work for me to do at Inscription House, which was very busy. I mostly worked in the new store, ringing up grocery purchases and loading hay into people’s trucks. That summer was an important experience for me, but I have a hard time explaining exactly how. The next summer, I went out again, but only to Inscription House and for a longer period of time; I forget exactly how long, but it was a few weeks. I also spent some time that summer working for some other relatives in Kayenta, but that’s another story. Later, when I was in college, I went back out to Inscription House for part of one winter break. This time, Al had me working in the old store, with the hardware. This was more of a challenge, since I was often the only one working there, and the customers who came into the old store were often older men who didn’t speak any English. I had taken a little Navajo at UNM when I was a senior in high school, but my knowledge was very rudimentary, and on multiple occasions I would try to use it and realize that I was soon in way over my head. One time, a guy walked in and I asked him what he wanted (that was one thing I could say), so he told me (uh oh). The only part I recognized was dibé, which means “sheep.” We sold lots of stuff that had something to do with sheep, though, since they’re the mainstay of the traditional Navajo economy. Eventually, after failing to get me to understand with words or gestures, he went out and got a younger guy, probably his son or nephew, to explain that what he wanted was a package of rubber bands used to castrate sheep by wrapping around their testicles. There were other incidents like this, but this one was typical and I remember it particularly clearly. One other incident also shows something of what it was like at Inscription House in a more unusual way. Trading posts had traditionally sold guns and ammunition, which were necessary tools for life early on. One of the most infamous events involving the sale of a gun at a trading post was of course the murder of Richard Wetherill in 1910. By the time I was at Inscription House, however, relatively few stores did much business in guns, although they often sold ammunition and I sold quite a bit. Al, being a rabid rightwinger, however, made a point of putting guns on display in a prominent location behind the counter but easily visible to customers walking in. Most of these were standard hunting rifles, which is what the few people who might want to buy a gun at Inscription House were likely to need, but as a pointed jab at the liberal establishment or whatever Al had an AK-47 in the gun rack next to them. I’m sure he didn’t expect anyone to buy it, but I think he just wanted to flaunt his constitutional right to sell it or something. Anyway, one day an old guy came in and asked in Navajo for “the little gun.” I pointed to one of the smaller rifles, but no, he made it clear that it was the AK-47 he wanted to see. So I took it out of the rack and handed it to him. He looked it over and asked how much it was; it was $475, surely well beyond his means, and in any case there’s no way this old guy who didn’t speak any English would have any idea what to do with a weapon like that. After examining it for a while he handed it back to me and went on his way. I mention this experience not because it was typical of life at Inscription House or in the Southwest but because it wasn’t. This was an exceptional event. People would often come in to buy bullets, but no one ever bought a gun while I was there. Similarly, they often bought chainsaw parts but never a whole chainsaw, which we often sold. We did some chainsaw repairs too (which I didn’t do personally). There was a lot of demand for those because it was winter and a lot of people in that area, which gets very cold, heat their hogans with wood. Nevertheless, the AK-47 story sticks with me. So does the whole experience, however brief, of working at two of the few remaining trading posts on the Navajo Reservation. It’s hard to express what this background and these experiences mean to me. Thinking about them often casts my current lifestyle, here in New Jersey, in bold relief. It’s not so much that I don’t enjoy it here or that I feel homesick; I do enjoy being a grad student, and I like New Jersey, and what I feel is not so much homesickness as maybe nostalgia or something similar. It’s not that I want to go back to the trading lifestyle, because I can’t, really. The lifestyle no longer exists, and what I experienced of it was but a pale shadow of what my great-grandparents and grandparents spent almost their whole lives doing, and even what my parents spent large portions of theirs doing. I don’t speak nearly as much Navajo as my dad did or my grandfather did, and I probably never will, because they learned Navajo because they had to, at a time when few Navajos spoke English. 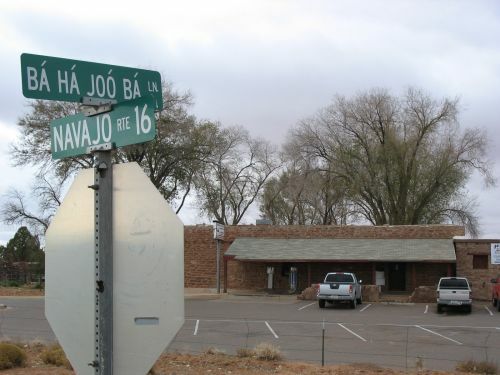 Now most Navajos speak English, and learning Navajo is not something anyone really needs to do. It’s really hard, too, so it’s not something most people want to do either, and while I do want to do it I doubt I’ll ever really find the time or the motivation. I rarely tell people I meet about this trading stuff. I feel like it belongs to my background and it’s very important to me, but precisely because of that I don’t feel like I can really explain it to people. I don’t feel like I can make people understand the way I feel about it. Even if I were to bring them out to the Navajo country and try to at least show it to them, they wouldn’t see what I see. It’s not about what you see in a landscape, after all, but what you know about it and how you feel about it that gives it significance. This applies equally well to the urban and suburban settings in which I find myself now, of course, and to the people who come from these backgrounds, whether in the Northeast, the Southwest, or elsewhere. We can connect on a certain level, of course, since growing up in most parts of the US is pretty much the same these days, and my experiences in Albuquerque are fairly comparable in a lot of ways to the experiences of people in New York or New Jersey or wherever. But there is always something more, something you experience personally about the places you have lived and been and had important, life-changing experiences, that you can never really explain to anyone else. For me the most significant of those places are the trading posts, the places where for a few brief moments I, like my ancestors before me, sat for the sake of the merchandise. Regular readers will probably have guessed that the reason I haven’t been posting very often lately is that I’ve been very busy with school. This week is my Spring Break, however, and I’m in New Mexico visiting my mom, so I have a little time. 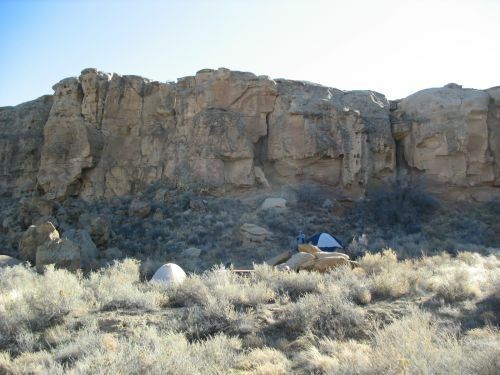 This past weekend we went out to Chaco and camped, which was interesting to me since I haven’t camped at Chaco since the first time I went there with my parents several years ago. It was a different way to experience a place I’ve seen a lot of, and it was fun to go to Pueblo Bonito and Casa Rinconada with my mom and the friend of hers who accompanied us. 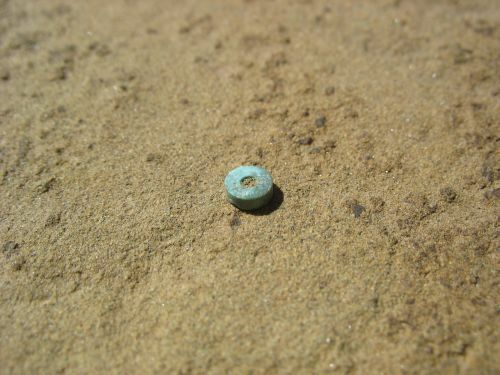 The friend’s 12-year-old daughter also came, and she found a beautiful turquoise bead in an anthill at Pueblo Bonito that was perhaps the highlight of the trip. Finding it reminded me that I’ve been reconsidering some of my ideas about the relationship between Chaco and turquoise, and I should do a post about the topic when I get a chance. My mom and I camped for two nights (the friend left earlier because her daughter got sick), and the second night it was very cold, as is typical for this time of year, so it wasn’t the most comfortable camping experience I’ve ever had but it was fun nonetheless. The Chaco campground is one of the nicest I’ve ever seen, and it was quite a pleasant little trip all around. I may not have time this break to do much more blogging, but I figured I should note this experience so people know what I’ve been up to.